The average winter break for a student from the University of Chicago consists of little more than rest and relaxation. Those who are more academic may try to read that next chapter in their math textbooks or get ahead on Hum reading, but for the most part, winter break is code for excessive sleeping. For some varsity athletes, however, this was not the case. Many members of the swimming and diving team went to Florida for a training trip. One swimmer had a different idea all together. George Gvakharia, a first-year from Huixquilucan, Mexico, competed in the Mexican Short Course Nationals in Guadalajara over the break. He is still registered with his old team in the Mexican Swimming Federation, which means that he was automatically signed up for the meet. That did not necessarily mean that he had to attend the event hosted at the Scotiabank PanAmerican Aquatics Center, however. “The Mexican Swimming Federation paid for my entire trip as an additional incentive to race at Nationals,” Gvakharia said. Evidently, the incentive worked. When it came to getting permission from head coach Jason Weber, Gvakharia had to inform rather than ask. “Since the start of this season, Coach Weber had been considering sending me to Nationals, instead of going on the training trip. He was very pleased with the idea,” Gvakharia said. With his coach’s permission, there was nothing left to stop Gvakharia from taking advantage of this great competition. “I couldn’t miss the opportunity to race in my home country,” Gvakharia said. Gvakharia has competed at the Mexican Nationals since he was 11 years old. Still, this year was his last chance to participate as an age group swimmer, being under 19 years of age. Though he had initially planned to join his teammates on their trip to Florida, the chance to test himself, combined with nostalgia for a meet he had participated in since his youth, persuaded him to return home. “This meet presented the opportunity to measure my relative progress compared to last year’s performances and let me see whether I had to make any adjustments for the second part of the season,” Gvakharia said. Away he flew, down to Mexico to swim and recapture his childhood memories. Gvakharia was at the meet for about six days, prior to which he spent a week training with his old team. In the meet, Gvakharia competed in the 50-meter and 100-meter freestyle, as well as in the 100-meter and 200-meter backstroke. “[I finished] second in the 200-meter backstroke and third in the 100-meter backstroke,” said Gvakharia of his accomplishments in Guadalajara. Those medals put his career total at 35. As if two medals at a national meet were not impressive enough, the success becomes even more notable when considering the circumstances. “I raced at an altitude of 9,000 feet, and my times were pretty close to the ones I got here in Chicago during the Phoenix Invitational a couple of months ago,” Gvakharia said. In other words, not only did he come in second and third in two different races against swimmers from all across his country, but Gvakharia also managed to record times of essentially equal value to those he put up in Chicago, at an elevation of a mere 597 feet. While these achievements might lead an average swimmer to rest on his watery laurels, Gvakharia is not of that breed. “I can still get a lot faster. I’m still far from achieving my real potential,” said Gvakharia, indicating a desire to work harder during winter quarter with the Maroons. In terms of his future, Gvakharia has at least one unique swimming prospect on the horizon. The potential for the Olympics is certainly exciting. It would require a lot of work and improvement over a relatively short period of time, though, as the Opening Ceremony of the Games is scheduled for Friday, July 27 this coming summer in London. Gvakharia is aware of the need to work if he wants to see the Olympics this year. “I still have a long way to go in order to be able to achieve this goal,” he said. By competing at the Mexican Short Course Nationals in Guadalajara over winter break, Gvakharia took a few initial steps on the path that he and his coach hope will lead him to England and beyond. 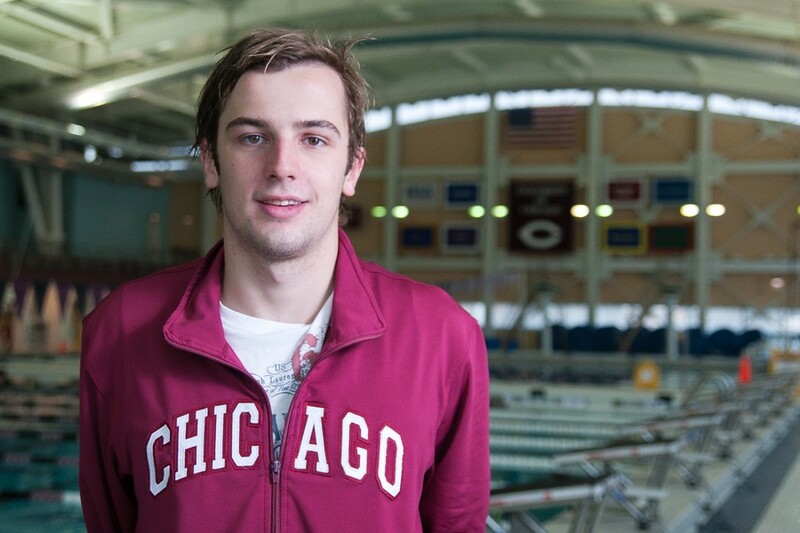 “It’s very exciting to have a swimmer of his caliber on our team, and he’s only going to get better,” Weber said.